It's time. 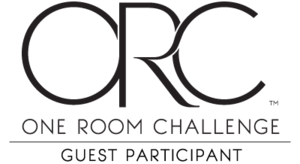 The One Room Challenge is here again. After last fall's challenge, during which we completely renovated our master bathroom, we managed to remodel our daughters' bathroom, then *almost* finish our second story. All it lacks is paint, caulk, and some decorating. Then Patrick called me out of the blue one day and told me it was time to order the dumpster to begin our downstairs renovation. We hadn't made any plans for downstairs yet, but we figured keeping momentum was the way to go. In retrospect, this was a big mistake. If we had it to do over again, we would take the time to completely finish upstairs, celebrate, and regroup. A blurry but seemingly long amount of time later, here we are. The last few weeks have been filled with us taking turns convincing each other not to work on the house each day; we've burned out big time. This challenge is our desperate attempt to light a fire under our tired backsides and get this dang thing done, because we're tired of freezer meals and washing dishes in the bathroom! Our pictures for the first few weeks will be what I can find on our phones, because we had zero intentions of participating. We're still in the early stages of this room, but we honestly thought we would have finished weeks ago! Our kitchen is almost exactly ten feet by ten feet. Originally, it had a small doorway into the dining room (which we'll use as a study), and a peninsula separating it from the breakfast area and the former living room/future dining room. This was taken on closing day. Not our trash! It was irreparably dirty. The seller was a single older man who didn't seem to value the idea of cleanliness. The cardboard box on the counter used to hold raw steak. He left it there for us with its blood juice for a few days before our walkthrough. It smelled awesome. The fridge was full, and although the power was never turned off (praise God), it still reeked. The laminate counter seams were all swollen with who-knows-what kind of awful moisture. There were roach droppings in the cabinets. Everything was saturated with cigarette smoke. This was seriously a dark time for us. Just looking at these photos makes me want to cry for the old me who had to deal with it. The layout wasn't functional. The corner cabinets were virtually unusable, the stove being adjacent to a walkway felt unsafe, and we knew that any time we entertained, the room would be a bottleneck nightmare. The finishes were awful. Everything was tobacco colored, from the fake mosaic tile floors, to the cabinets and countertops, to the walls, outlets, and light fixtures. We repiped the house with PEX during our master bathroom renovation. During the process, we needed to remove some small sections of ceiling. We also hired someone to move the gas line for our oven, which required removing a sizable section of the ceiling. We lived like this for three million months. Like I said, time is a little fuzzy during our renovations. The following images are from instastories, and they reveal how very naive and optimistic we were at the beginning of this journey. Feel free to laugh at us: I did. Please note: we purchased and still haven't installed the GFCI. We risk death every time we make coffee. hahahahahahahahaha you poor innocent thing. Yeah, so thus begins our challenge. It should be interesting to follow! Next week I'll share our design plan for the space. There are so many great guest participants! You should go check them out at http://www.oneroomchallenge.com/orc-blog .